This article is about R.O.B. 's appearance in Super Smash Bros. Ultimate. For the character in other contexts, see R.O.B..
R.O.B. 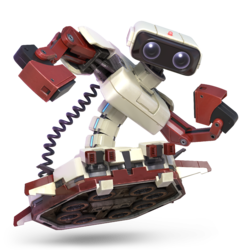 (ロボット, Robot) is a playable character in Super Smash Bros. Ultimate. He was confirmed as a playable character on June 12th, 2018. R.O.B. is classified as fighter #42. R.O.B's beeping sound effects from Brawl and Smash 4 were repurposed for Ultimate. Play VS. matches, with R.O.B. being the 31st character to be unlocked. Clear Classic Mode with Pikachu or any character in its unlock tree, being the third character unlocked after Shulk. Have R.O.B. join the player's party in World of Light. With the exception of the third method, R.O.B. must then be defeated on Wrecking Crew. Likely as a result of his mid-low tier placement in SSB4 (36th out of 55th), R.O.B. has been considerably buffed in his transition to Ultimate. One of his biggest buffs was to Arm Rotor: The move has less start-up, traps opponents in the looping hits significantly more reliably, and had much stronger knockback on the final hit. All of these changes has turned what was previously considered an all-around useless move into one of R.O.B. 's most dangerous moves in his toolkit, functioning both as a powerful combo finisher and a reliable edgeguarding tool. Robo Beam reaches its charge state sooner and Gyro can now be jump cancelled, improving his mix-up options involving his projectiles, and all-around improve his strong zoning game. His ground game has also improved, with dash attack having less endlag, making it a harder move to punish as well as improving its combo potential, and his forward smash and down smash are now more reliable finishers, with the former having increased range, and the latter now sending opponents at a consistent angle. Lastly, his aerials have been considerably improved: Neutral air has reduced start-up, landing lag, and increased range, making not only more useful in combos, but also makes it a more reliable move to come down from the air with. Back aerial is much stronger and harder to punish due to changes to shieldstun and its landing lag reduction, down aerial has more knockback, making it a more dangerous edgeguarding tool, and up air sends more vertically upwards, allowing it to vertically KO earlier. However, R.O.B. has received a few nerfs. His grab game has been weakened overall, with universal changes to grabs hindering the safety of his grabs. His up throw has increased endlag, making follow-ups harder, and his down throw now buries, allowing for guaranteed follow-ups at high percents, but removes any guaranteed set-ups at low to mid percents, particularly his effective down throw-up air combo, dubbed the "Beep Boop". Lastly, he retains a few of the same issues from his SSB4 counterpart, where his unusually large size and lack of fast aerial options leaves him susceptible to juggling, with the buffs to his neutral air failing to fully address this issue. Overall, R.O.B. 's buffs heavily outweigh his nerfs, though how he fares compared to the rest of the cast is currently unknown. R.O.B. 's results in the early metagame of Ultimate have been very strong, where he is currently represented by notable players such as 8BitMan and WaDi. As with all veterans returning from SSB4, R.O.B. 's model features a more subdued color scheme. His body has a duller matte finish, and his eyes are less reflective. As a result, he more closely resembles the original peripheral. R.O.B. 's eye expressions are now seen properly at all times, as in Super Smash Bros. for Nintendo 3DS. During his side taunt, R.O.B. now emits purple flashing sparkles from his eyes instead of white. R.O.B. 's dash animation is slightly altered. R.O.B. 's double jump animation is now a midair twirl. R.O.B. 's Hurtbox appears to be slightly smaller as a result of his character model being shrunken. Like all characters, R.O.B. 's jumpsquat animation now takes three frames to complete (down from 5). R.O.B. walks slightly faster (1.122 → 1.178). R.O.B. 's initial dash speed is much faster (1.3 → 2.002). R.O.B. dashes much faster (1.568 → 1.725). R.O.B. 's air speed is slightly higher (1.08 → 1.134). The re-introduction of directional airdodges improves R.O.B. 's recovery, as he can airdodge after he has ran out of fuel in his Robo Burner. The first hit of neutral attack can be held for a consecutive jab. Forward tilt deals more damage (5%/6% (arm)/8% (arm's tip) → 8% (arm)/10% (arm's tip)). Up tilt's knockback angle was changed to be more horizontal. Dash attack has reduced endlag (FAF 35 → 31), improving its combo potential. Forward smash has a larger hitbox. Forward smash's charging animation has been changed to resemble its animation in Brawl. Down smash only hits 3 times instead of 5, reducing its overall damage output (2% (hits 1-4 base), 1.5% (hits 1-4 tip), 5% (hit 5), 13%/11% (total) → 3.5% (hits 1-2 base), 3% (hits 1-2 tip), 5% (hit 3), 12%/11% (total)). The side of which Down smash launches opponents is no longer random, the front hits always launch in front of R.O.B. and vice versa. All aerials have less landing lag (12 → 7 frames (neutral), 15 → 9 frames (forward), 22 → 13 frames (back), 22 → 13 frames (up), 21 → 12 frames (down). Has more range and faster startup (18 → 14 frames). Deals more damage (8% (base)/6% (tip) → 9.5%/7.5%). It slows down R.O.B. upon hitting a shielding opponent. Deals more damage (12% (base)/10% (tip)/6% (late base) → 15%/13%/9%). Due to the changes to shieldstun, the move has become significantly safer on shield . Up aerial's final hit comes out quicker (frame 26 → 23). This allows the final hit to connect better with the initial hits. The move's duration has been unchanged, resulting in increased endlag overall. Up aerial's knockback angle was changed to be more vertical. R.O.B. faces further forward when performing his down aerial. Standing grab and pivot grab have slightly reduced start-up (frame 7 → 6 (standing), frame 11 → 10 (pivot)). All grabs have increased endlag (FAF 30 → 37 (standing), FAF 37 → 45 (dash), FAF 36 → 40 (pivot)). R.O.B. has a new pummel where he headbutts the opponent. This pummel is faster, but also deals less damage (2% → 1.3%). R.O.B. has a new forward throw where he takes his right hand back and throws them. Forward throw has reduced endlag (27 frames → 23). This, combined with R.O.B. 's increased mobility, grants the move combo potential at low percentages. Up throw rises higher during the animation. Up throw has more endlag (74 frames → 81), hindering its combo potential. This allows for more read-based followups, including up tilts, and KO's with Up Smash, although no follow-ups are guaranteed. The new, more consistent attack sacrifices the potential for early KO's that 'Beep Boop' could achieve in Smash 4 although it is still possible at low percentages or if the opponent doesn't mash out fast enough. Down throw deals much less damage (10% → 5%). Down throw has more endlag (65 frames → 75). Robo Beam deals significantly more damage when fully charged. (10% (Super Robo Beam)/17% (point-blank Super Robo Beam) → 15%/22%). Robo Beam overall charges much faster than before, being able to reach its fully charged state much earlier. Fully charged Robo Beam's graphic is flashier. Fully charged Robo Beam is larger, making it easier to hit opponents. Arm Rotor has significantly faster startup (frame 16 → 13) and the move itself is executed faster, improving its safety; the move also has less endlag (46 → 41 frames). Arm Rotor's hits connect more reliably and the final hit can kill more reliably. These changes, combined with the ones above, make it much more effective as both an edgeguarding tool and a potentially devastating combo finisher. Arm Rotor deals more damage per hit (1% → 1.5%), but only hits every five frames as opposed to three, reducing its overall damage output. R.O.B. has a gauge on his chassis that shows how much fuel he has left for Robo Burner. Robo Burner has new particle effects. Robo Burner can be jump cancelled. Robo Burner can be cancelled immediately into an air dodge if one is available. Gyro can be returned to its dock when in hand. Gyro can be jump cancelled while charging. R.O.B. has a new Final Smash called Guided Robo Beam, in which he fires multiple small red beams that ricochet and home in on enemies, before firing a larger green beam that enlarges at the last second. This is a massive improvement over Super Diffusion Beam, as it is much easier to hit opponents. Robo Beam deals less shield damage. Gyro deals less shield damage. 8% (arm), 10% (arm's tip) A lunging hook. It can be angled. 3% (hit 1), 5% (hit 2) Thrusts his arms upward. 5% Thrusts his arms low along the ground. 7% A double forearm club. S3 15% (base), 11.5% (middle), 6% (tip) An optical energy blast, similar to the uncharged Robo Beam. It can be angled. 3% (hit 1), 14% (hit 2) Performs a handstand and activates his thrusters to emit a fiery blast upward. 3.5% (hits 1 and 2), 5% (hit 3) Lowers his torso and spins it around rapidly while outstretching his arms to perform a series of discus clotheslines, similarly to Arm Rotor. AirN 9.5% (base), 7.5% (tip) Activates his thrusters to somersault and emit a fiery blast in a circular motion. Air Boosters 15% (base), 13% (middle), 9% (late base/middle) Leans forward and activates his thrusters to emit a fiery blast behind himself. Back aerial can also be used for horizontal recovery, as it slightly propels him forward and does not consume Robo Burner's fuel. 1.5% (hits 1 - 4), 4% (hit 5) Rapidly rotates his arms upward, ending it with an upward double forearm club. 12% (base), 11% (middle), 6% (tip) Activates his thrusters to emit a fiery blast downward. The middle portion of the blast is a powerful meteor smash. 8% While holding the opponent in his "hand", R.O.B. pulls his arm back and then flings it forward, throwing them away. 10% Flings the opponent behind him with both of his arms. If fully charged beforehand, Gyro can follow up from a back throw from low to mid percentages. 12% Performs a jet-propelled reverse piledriver. 5% R.O.B. flips the opponent over and drills them into the ground headfirst, burying them. 9% Swings his base forward and activates his thrusters to emit a fiery blast forward while climbing up. Dispite the appearance, it doesn't posess a flame hitbox. Robo Beam 7% (Uncharged Robo Beam), 11.5% (Robo Beam, point-blank), 4.5% (Robo Beam, long range), 22% (Super Robo Beam, point-blank), 15% (Super Robo Beam, long range) An optical laser with 3 different levels: Uncharged Robo Beam, Robo Beam, and Super Robo Beam. Uncharged Robo Beam is a very small energy blast instead of a laser, and can only damage opponents at point-blank range. However, it can be fired consecutively and has deceptively high knockback growth, which allow it to ward off nearby opponents. Conversely, both Robo Beam and Super Robo Beam can damage opponents from afar and ricochet, but cannot be fired consecutively. Robo Beam and Super Robo Beam also deal noticeably more damage when fired at point-blank range. It is one of R.O.B. 's options for zoning alongside Gyro, with Robo Beam being better for his neutral game, while Super Robo Beam is better for surprising opponents. The light on R.O.B. 's head indicates the level: a dim, slow-paced pulsating glow indicates an Uncharged Robo Beam; a brighter, moderate-paced pulsating glow indicates Robo Beam; and a bright, rapid-paced pulsating glow indicates Super Robo Beam. 1.5× reflected projectile Rapidly spins his torso around to perform a series of discus clotheslines that concludes with an uppercut. Mashing the special button extends the duration of the move. It can also reflect projectiles and move R.O.B. forward or backward while the control stick is tilted in the respective direction. Robo Burner 0% Activates his thrusters in order to fly. It grants impressive vertical and horizontal recovery distance, although R.O.B. has a set amount of fuel, indicated by the gauge in his chassis, to use in order to perform this move. Fuel is recovered over time as long as R.O.B. is grounded. This doesn't cause helplessness, allowing R.O.B. to fast fall, air dodge, or attack with any aerials or any of his other specials either through its duration or after its conclusion. R.O.B. is also immune to footstool jumps while using this move, although other characters can still jump off of him regardless. It also grants intangibility on frames 2-4, but only when performed on the ground. Gyro 6.1%-8.7% (uncharged), 7.2%-10.8% (fully charged), 5% (idle Gyro) Charges a spinning top on his base. R.O.B. 's other zoning option alongside Robo Beam, it can be picked up and thrown as an item after making contact with either the opponent or the stage. However, opponents can do the same and thus use the top against him. Only one Gyro can be active at a time, and attempting another will result in R.O.B. flailing in confusion. If R.O.B. is holding his Gyro, he will be able to charge it again. Typically, an idle Gyro deals little knockback when touched, (albeit enough to harass anyone trying to get past), but it can lock. Guided Robo Beam 1.2% (homing lasers), 1% (laser loop), 3% (enlarged laser loop) Re-configures his body into a cannon-like form, and begins to charge energy. During the charge, he fires smaller red lasers that home on opponents in front of him. He then unleashes the built up energy in the form of a green laser, which can be angled up or down. As the Final Smash begins to end, the laser briefly enlarges, becoming wider and more powerful. While advancing forward, R.O.B. rotates his "hands" outward while his arms point out straight. After halting, he spins his arms in alternating directions and rotates his head 360° counterclockwise. Afterwards, he adjusts his arms to face upward, continuously raising and lowering them in a flexing gesture. R.O.B. 's head also rotates 360° clockwise after every 2 times he pumps his arms. Hovers in the air, spins, and lands. He then proceeds to continuously lower and raise his arms while rotating his head. Turns his head and flashes the lights in his eyes while clapping. He then proceeds to continuously clap, lowering his arms after each clap. In the NES game Stack-Up, the first game that the R.O.B. accessory was compatible with, this track would play before starting memory mode. In this remix, a short intro is added, and the first part is repeated once. 8BitMan - Debuted as one of the best R.O.B. players in the world from 4 and placed 17th at GENESIS 6, 9th at Smash Conference United and Glitch 6. GwJ - Placed 13th at Let's Make Moves while defeating Larry Lurr. Somo - Placed 17th at Umebura SP 3 with a win over Cosmos. WaDi - Debuted as one of the best R.O.B. players in the world from 4 and placed 25th at GENESIS 6, 7th at Glitch 6, 3rd at Heart of Battle and 33rd at Frostbite 2019. He has taken sets off of SDX, Lima, Larry Lurr, and VoiD. R.O.B. 's opponents all wear masks or lack expressive faces. 1 Meta Knight Halberd Pink Ball Activate! Although R.O.B. does not appear in the World of Light opening cutscene, he was vaporized and later imprisoned alongside the rest of the fighters (sans Kirby) when Galeem unleashed his beams of light. R.O.B. was one of the many fighters that fell under Dharkon's control upon Galeem's first defeat. He can be found in the Mysterious Dimension sub-area, as the fighter closest to the entrance, standing in a floating island with scattered mechanical junk. To reach him, the player must first defeat the spirit of Redd as the answer to a trivia question ("Which of these spirits sells furniture? "), allowing access to the island he's in. R.O.B. 's Fighter Spirit can be obtained by completing Classic Mode. It is also available periodically for purchase in the shop for 500 coins. Unlocking R.O.B. in World of Light allows the player to preview the first spirit below in the Spirit List under the name "???". As a Fighter Spirit, it cannot be used in Spirit Battles and is purely aesthetic. Each Fighter Spirit has an alternate version that replaces them with their artwork in Ultimate. Additionally, R.O.B. makes an appearance in a few Support Spirits. R.O.B. 's default color scheme for the international versions of Ultimate. Taunting on Shadow Moses Island. Taunting on Port Town Aero Dive. Attacking Mega Man with Robo Beam on Battlefield. Crouching with a buried Wario on Gaur Plain. Attacking Marth with his down smash on Tomodachi Life. Blue, metal, and pink R.O.B.s with a Bombchu on PictoChat 2. Crouching with Snake on Magicant. Getting kicked by Sonic on Skyworld. Using his back aerial on Lucas on Magicant. regions on R.O.B. 's default costumes. R.O.B. 's stock icon is one of four to show eyes, the others being Kirby, Meta Knight, and Sonic. On the official site for Ultimate, each character is accompanied by a background image of a stage from their universe. As R.O.B. is the only character to not have a stage from his home universe, his page is the only one with no stage for the background image. Coincidentally, all four are Brawl newcomers. R.O.B., Cloud and Ice Climbers are the only fighters that cannot receive a series bonus since they don't have any primary spirits from their own series. Since the Famicom R.O.B. is the default costume in the Japanese version and a few spirit battles feature a Famicom R.O.B., He is technically one of the five characters that can use a “default” costume in spirit battles, the others being Corrin, Yoshi. Robin, Inkling, Joker, Mr. Game & Watch, Bowser Jr., and Alph, although Alph and female Corrin are merely alternate characters using their “default” colors. R.O.B. 's NES color scheme is the only one which bears the NES' base sticker which reads "Robotic Operating Buddy"; all other palettes bear the Famicom base sticker, which reads "Family Computer Robot". This page was last edited on April 19, 2019, at 11:31.